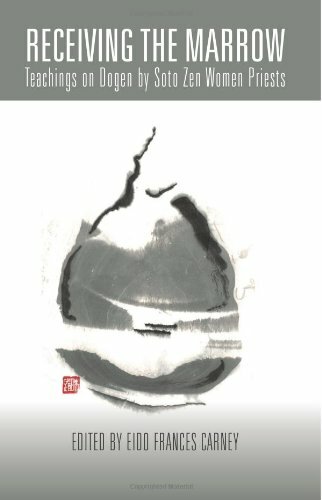 Receiving the Marrow: Teachings on Dogen by Soto Zen Women Priests, ed. Eido Frances Carney, Temple Ground Press (www.olympiazencenter.org), 2012. “As far as I know, this is the first such collection by women Soto Zen teachers in the West. These are the fruits of their decades of study and practice. …Reading these essays, we can see what Dogen taught about the equality of eight hundred years ago was true. I sincerely make prostrations to these women teachers for their attainment of the Dharma.” Shohaku Okumura, translator Dogen texts and author of Realizing Genjokoan: The Key to Dogen’s Shobogenzu. “to have a direct mind is to doa all our activities as holding up the moon, connected with the universal perspective, and therefore, nothing we do is in vain.” Byakuren Judith Ragir, Clouds & Water $20.00 includes shipping.